Cypselus comatus Temminck, 1824, Sumatra. Two subspecies. English: Lesser tree swift; French: Hйmiprocnй coiffй; German: Ohrenbaumsegler; Spanish: Vencejo Arborнcola Chico. 5.85 in (15 cm); 0.8– 1.0 oz (21–26 g). Head and sides of throat glossy blue-black (with greenish gloss when fresh), body bronze olive, wing and tail dark. 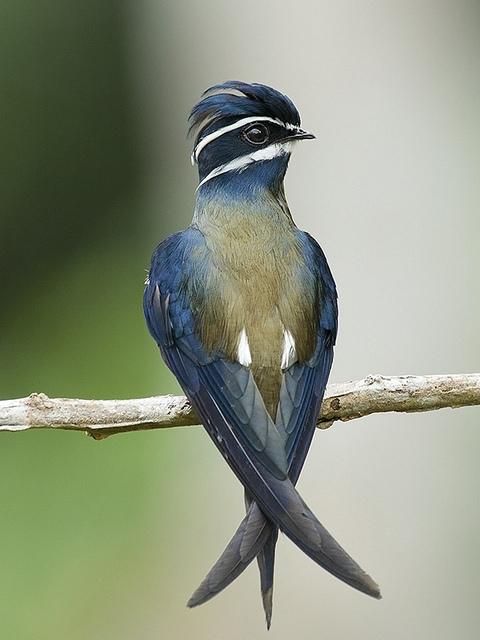 Short forehead crest and long lanceolate feathers in facial region forming two white stripes from lores over the eye to nape and from chin along jawline to side of neck. 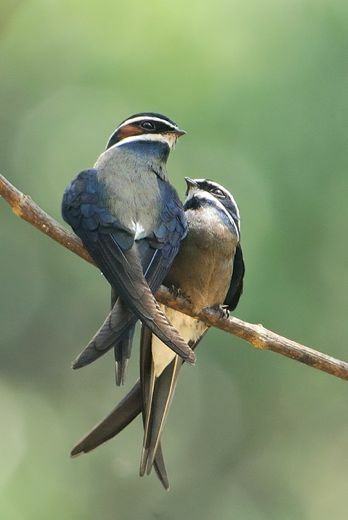 Ear coverts glossy blackish in females and rufous in males. Peninsular Thailand and Malaysia, Sumatra, Borneo, and Philippines except Palawan. Forages over canopy and edge areas of lowland forests. 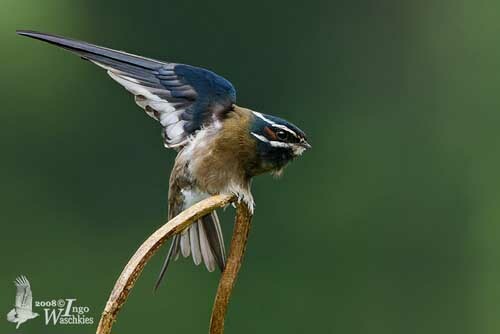 Utilizes midlevel bare twigs of forest trees as perches from which to make brief foraging flights. Has characteristic upright stance when perched with short crest erected. 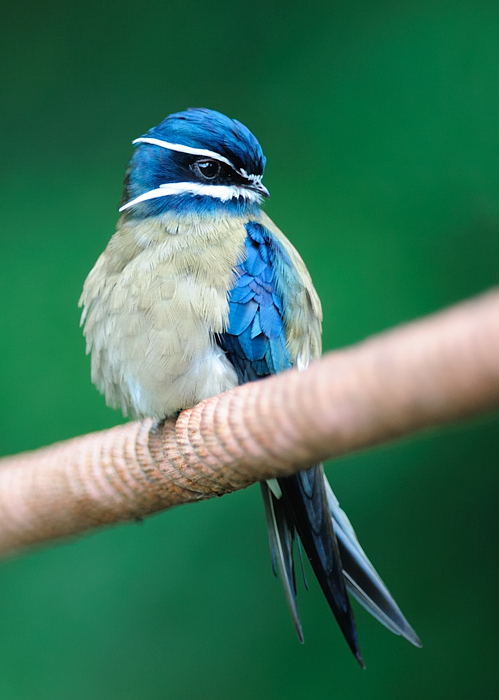 Makes swooping flights in search of aerial prey, often returning to original perch. Appears to be territorial year-round only sharing foraging area with newly fledged young. Not as social as other tree swifts which may at times gather in larger groups. Utilizes lower perches than gray-rumped tree swift when inhabiting same area. Feeds on presumably a large array of aerial insects taken on the wing. 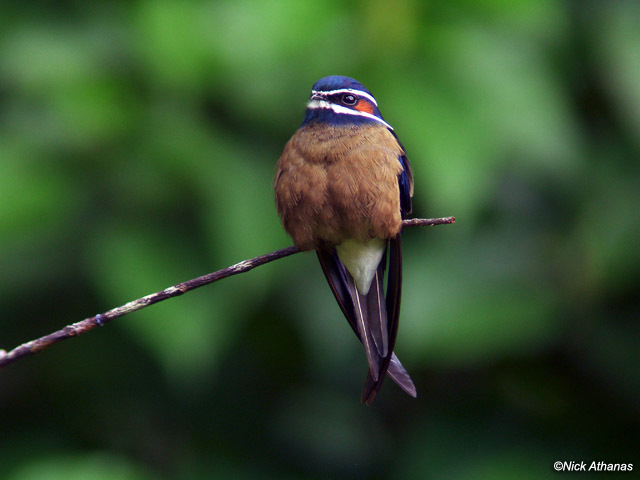 Makes tiny nest glued to horizontal branch characteristic of the family. The single white egg is incubated for about 21 days and the combined incubation and fledging period takes approximately 50 days.